To improve the safety, quality and efficiency of inpatient admissions by utilizing an innovative, interdisciplinary, patient‐centered approach to care delivery at the point of patient admission. The synchronized admission team consisting of a hospitalist, nurse, clinical pharmacist and social worker and /or case manager, each with defined roles, was stationed in the Emergency room (ED). Within minutes of receiving a texted team alert from the ED about a patient requiring admission, the team convenes in a “Brief” to discuss pertinent medical records and ED course. This is followed by a bedside history and physical exam, requiring the patient to share their story only once to all members of the admission team. 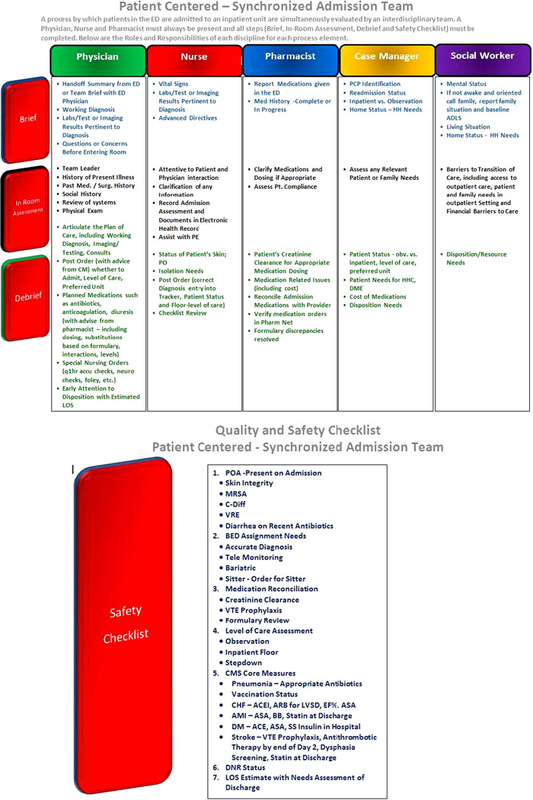 A Quality and Safety checklist is utilized to ensure discussion of key safety elements such as medication reconciliation, level of care assessment, core measures and goals of care. During the team “Debrief” which follows, the plan of care is established and then shared with the patient and family. A total of 1123 admissions have been completed by the synchronized admission teams within the last year. We saw a decrease in Case Mix Index adjusted length of stay by 0.4 days from historical controls and by 0.26 days for contemporaneous controls (p= 0.076). Readmission rates in 30 days were reduced 48% below historical data and 33% below contemporaneous controls (p =0.053). Rapid response calls were reduced by 48% compared to historical data and by 38% compared to the contemporaneous control group (p= 0.79). Of the 2499 medications modified or requiring Pharmacist collaboration at the time of physician order entry, 27% of the interventions were related to high‐risk medications. This process did not increase average ED boarding time, despite the completion of the admission process taking place in the ED. Christiana Care Health System’s innovative admission model embodies interprofessional collaborative practice and aligns with the Triple Aim goals. Results to date suggest the long‐term benefits of reducing costs, eliminating redundancy and increasing the effective use of resources. This process has also engaged physicians in emphasizing the importance of patient and family centered care to the teams they lead. We continue to explore the value of the synchronized admission team for medical patients and have a vision of “every patient every time’’ receiving the benefit of a patient‐centered interprofessional team admission. Jordan J, Bhamidipati S, Elliott D, Eldridge K, Kumar B, O’Hara‐Moffo M, Greer D. Patient Centered ‐Synchronized Admission Team. Abstract published at Hospital Medicine 2014, March 24-27, Las Vegas, Nev. Abstract 706. Journal of Hospital Medicine. 2014; 9 (suppl 2). https://www.shmabstracts.com/abstract/patient-centered-synchronized-admission-team/. Accessed April 25, 2019.